A one-armed Twitch streamer known as “ToeYouUp” won his first game of Apex Legends—a feat that many players with two functioning hands have yet to accomplish. 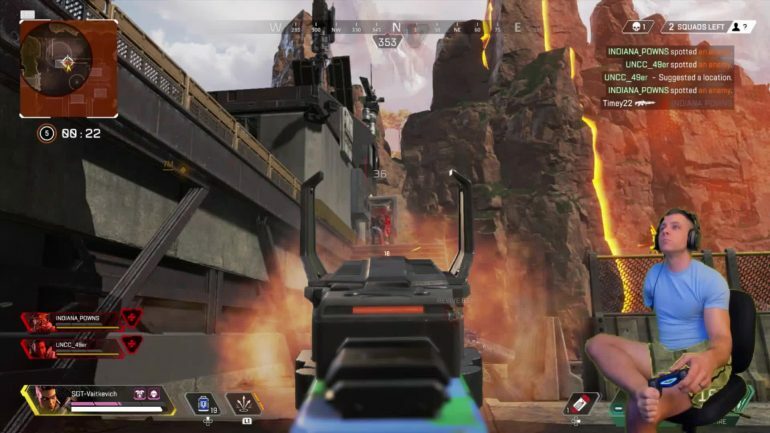 The U.S. Marine veteran plays Respawn Entertainment’s Apex Legends, the latest addition to the popular battle royale genre, as well as other first person shooters in a unique fashion. Losing his right arm in a motorcycle accident at the age of 24 hasn’t stopped ToeYouUp from following his passion and continuing to play video games, including Apex Legends and Battlefield V.
The amputee uses a standard PlayStation 4 controller propped up against his foot, using his fingers on his right hand and his toes on his left foot—that’s positioned up on his knee—to aim and shoot. The admirable ToeYouUp has learned to adapt to his disability and has perfected his FPS skills through hours of practice. One arm hasn’t stopped him from performing on stream—and winning his first game of Apex Legends proves that. His first win was posted on the Apex Legends subreddit, where he received positive feedback from the community, with some fans praising him for his stoicism and his one-handed dexterity. Others offered him advice, suggesting that he should try using a modified controller, such as the Xbox adaptive controller, to help him play with more ease.